Quite a thought isn’t it? The greatest hoard for decades has yielded less knowledge than it should have. Yet who can deny it? Two things suggest it’s true. First there’s this (courtesy of Paul Barford)…. . . 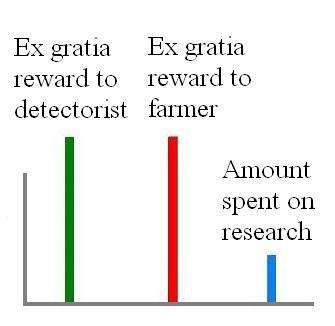 If only a way could have been found to give the farmer and finder a million or two less (like in most countries) then a million or two more could have been spent on research, for the benefit of the public. Second, there’s this: it has just been revealed that many pieces of the hoard jigsaw are missing so can’t be researched. Paul Barford (again) has asked the crucial question: “and the missing bits? In whose collection are they now?” We don’t know Paul, but we do know there are only 3 possibilities: a.) The missing bits were never in that field b.) The missing bits are still in that field c.) They’ve been stolen by nighthawks. Our bet is a mixture of b.) and c.) – some have been nighthawked and some are still in the field. We base that on both logic and evidence. In 2009 when the archaeologists first organised a detecting survey, the new deep seeking machines hadn’t been invented. In 2012 when they returned and found another 90 pieces they had been but few or none were used in the search. Nighthawks on the other hand DO have deepseeking machines and we know, because we’ve photographed the evidence, that they have visited the field. Are they coming regularly, like happens at other high profile findspots? In which land of denial is that not happening? A reality check is long overdue. In 2012 when archaeologists went back to the site they were “stunned” that another 90 pieces turned up and said: “It’s absolutely amazing. In the last search they used top-quality equipment to go over the area, which they use to find underground stuff in Afghanistan. They were absolutely certain there was nothing else down there.” But actually, what both US and British forces were using at the time (and subsequently) were Ebex 420H machines which have little depth capability (mines are mostly at shallow depth) and are not recommended by the manufactures for use in iron contaminated soil or for finding very small targets. It would be nice if the Establishment swallowed its pride and accepted that we amateurs do have a point. They should arrange for a survey of the field using a large number of Minelab GPX 5000 and similar machines as soon as possible. The parts of the hoard that seem to be missing are base metal items from a helmet such as the eyebrow and face protectors and some of the fittings that would have been used to attach items to belts etc so it seems that whoever buried the hoard separated the non valuable base metal items and buried only the valuable gold, silver and jewelled items.Why this was done is still uncertain but it is speculated that these base metal items may have been melted down as a form of scrap whilst the valuable items were buried seperatley for reasons that still remain as conjecture currently. Also of note is the fact that there is not one single item that relates to a female such as feminine jewellery or other decorative items which gives credence to the theory that the hoard was ‘war booty’, either from one or more battles. The Staffordshire hoard may never reveal its real secret of as to why it was accumulated or buried which is why it is so beguiling. That may be broadly true but the archaeologists were “certain” they’d found everything in 2009 and then “stunned” to find a lot more gold and silver items in 2012. They intend to have another go “when the field is next ploughed” and I’m willing to wager they’ll find a lot more, especially if they use the right equipment. Meanwhile since at the Icklingham hoard site, which hasn’t had a tenth of the global publicity, there have been hundreds of nighthawk visits despite a battery of high tech security systems so it’s hard to think exactly the same thing isn’t happening in Staffs. The evidence so far does suggest otherwise and anything else is just speculative conjecture. The lack of base metal iems is however very telling in respect to the sorting of valuable items from non valuable before burial. The conservations so far is slowly starting to build up complete items (minus base metal) such as an elaborately decorated sword with a gold hilt and pommel. « For the avoidance of doubt, this will NOT be the only attempt to build houses in Oswestry Hillfort’s setting.